Steve Jobs went ballistic when public shipping manifests leaked the existence of the iPhone 3G. That’s about the only time something exciting happened in the freight forwarding business. The circulatory system of the global economy is a trillion-dollar industry, yet no one really talks about it, or builds tech for it. That’s what makes freight such a massive disruption opportunity for a startup like Flexport. Transparency begets data, which begets efficiency. Smarter shipping shrinks the physical world the way faster internet shrinks the digital one. New businesses emerge. High bandwidth connections paved the way for Netflix. Now Flexport could make meatspace merchants as nimble as Amazon. With $26.9 million in funding, Flexport grew the volume of goods it ships by 16X this year. Y Combinator president Paul Graham says “Flexport is one of that small handful of startups that are going to change the world.” Freight might finally be getting the weight of attention it deserves. So what the hell is freight forwarding? Stick with me. Anything weighing over 150 kilos can’t be sent like a parcel through the postal service. It qualifies as freight, and can require several separately owned vehicles to deliver it across land, sea, or air from its source like a factory to a destination like a retail store. 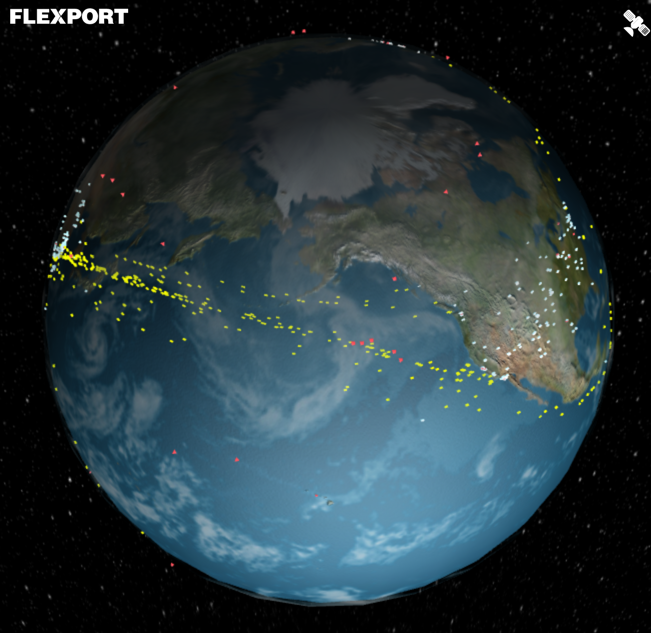 Each of these dots is a freight shipment currently on the move with Flexport. Yellow = ocean containers, Red = air freight (few because they arrive so fast), and white = truck. To get the best deal on each leg of the journey and handle the hand-offs through customs, freight forwarding services serve as an organizational logistics layer. They have direct relationships with carriers like truck owners and massive shipping container boats. That is, until Flexport indexed all the available carriers into a searchable database in its free software for organizing and tracking shipments. The reason that’s not crazy is that Flexport simultaneously runs its own freight forwarding service that’s optimized thanks to all the data sucked in by its free dashboard. By analyzing all the routes, rates, speeds, and customs compliance data of shipments booked through its full-stack software and service, it can find the most efficient way to get goods from point A to points B, C, X, Y, and Z. Over time, Flexport’s routing decisions are becoming more and more automated. But it also has humans on hand to fill the gaps when necessary, like with the Chinese trucking industry that’s resistant to modernization. Meanwhile, competitors are betting on hunches about the best routes because they don’t have complete data. Shipping began as a side-hustle for Petersen. As teenagers, he and his brother started buying stuff from China and then selling it stateside on the web. He moved to China in 2005 and spent two years in the supply chain trenches. That’s where Petersen stumbled upon public shipping manifests as an untapped gold mine, and started the company Import Genius to index them. Soon he incurred the wrath of Steve Jobs, as import genius led press to the fact that Apple was shipping crates of the as-yet-unannounced iPhone 3G from China. After two years of regulatory approvals and a stint in Y Combinator, Flexport has become that software. In 2016 it’s moved freight to or from 64 countries for over 700 clients like Ring and Le Tote, with a $1.5 billion annual run-rate of merchandise value shipped. There’s 2.4 million toys and 412,000 pieces of glassware currently in transit on the Flexport platform. Its investors include First Round, Founders Fund, Felicis, GV (Google Ventures), Box Group, Bloomberg Beta, and Ashton Kutcher. Other startups are also trying to muscle into the freight business with different focuses or business models. Haven provides a marketplace connecting commodity traders with carriers. Fleet, which launched at Disrupt SF 2014 as Shipstr, offers a broker marketplace too, while TruckerPath and Overhaul just orchestrate trucking over land. None of those approaches provide the freight omniscience Flexport gets from combining its logistics software data with its forwarding business execution. However, Flexport’s software only lets you book its freight forwarding service, so you can’t shop your shipment around to other services. Businesses have to hope Flexport’s savings from automation translate into competitive rates. Clients trade pricing visibility across the industry for transparency and control over exactly how their freight moves. Haven, for example, can provide a wide range of customizable shipping options. The biggest risk to Flexport could be changes to regulation since the company has to stay compliant across the world. Petersen also notes his concern about Donald Trump’s potential to become President and slap a huge tariff on goods coming out of China. Flexport could invade other parts of the freight ecosystem, but for now it’s trying to concentrate on its unique strengths. Petersen is giddy about the idea of creating “Amazon One-Click for the enterprise”. By using AI to monitor re-order cycles and plan future shipments, Flexport could allow businesses to instantly replenish their inventory when they run low. That term “schlep blindness” is something Graham came up with to describe the inability of innovators to spot potentially big ideas if they inherently involve a painful schlep — the Yiddish word for a tedious journey. Flexport is the perfect example of what can happen if entrepreneurs attack seemingly boring businesses. Petersen embraced both the literal and figurative schleps necessary to build something new in freight forwarding. Kissing the frog, no matter how unsexy, may end up turning him into a prince.